On Monday, I went out to the 'farm house' on Mill Creek Pike, to see that all was in order out there. Aside from the winter's fallen branches that were meant to have been hauled away by this time, everything looked ok. The Realtor was showing the place to an older couple. Hopefully, this beautiful home will be sold (or leased) soon. These pictures were not edited, except to resize them. The rose-colored flower is magnolia. The blooming trees are apples, the pods are wisteria. I loved the reflections in the pond. A Little more yardwork done today and the back yard is pretty well 'tidied up'. Bagged up and set out another four bags of leaves and cuttings. Next project is replacing the blade on the lawnmower, and mowing the front yards. Tomorrow's job, if it does not rain. It was nice this morning, sprinkled a light shower this afternoon. The rain and wind last week made short work of the magnolia blossoms, which are about all gone now. Some grape hyacinths have appeared in my front yard, periwinkle (vinca) are starting to bloom, and I have a sum total of four pink tulips. I saw a few bluebells opening in Kathy's yard. Peonies are shooting up, as are dutch iris, day lilies, some unidentified bulbs, hostas, and ferns. Much of these are in the beds with the liriope that I just finished cutting back, and is now showing new growth. Clematis are coming to life, hydrangea, everything. Even a dandelion. Here are today's 'best' photos. The amaryllis is amazing. The blooms are so big. I think this one has the largest flowers of any I've ever had. I set it by the bathroom mirror so I could show all of the flowers in one shot. Fourth bud will open today. Frosty this morning, but will reach 60. Sunny and still. Lovely day to do some more yardwork. A few narcissus blooming now behind my house, some also with lighter centers. Daffodils in other places, and a few grape hyacinths. The Rhodadendren blooms are less than two inches wide, but the centers (stamens) were interesting, up close. Not the sharpest pictures, but fun. The Rhodi beside Kathy's house is a nice site, viewable from my front door. Cloudy, a little misty this morning, after a rainy day yesterday. We needed the rain. My amaryllis bulb is doing it's magic act again. First sign of growth appeared less than three weeks ago, and today the first but opened. This is the third blooming of this bulb. It was a gift from Ed and Joyce Dec. 2006. Truly the gift that keeps on giving. Someone please leave a comment. I want to see if it works.?? Not bad for a couple days work, by an old woman. Thank heavens for curbside pickup. Ah, yes. Much better lighting in the midmorning sun. I was happpy to see that this morning's 32 degrees had not damaged the flowers. And I liked the sun and shade pattern of the garden gate on the brick path. I looked out the back window at sunset and notice the last rays were shining on something pink in Kathy's back yard. It was a little too late in the day for best pictures, but the pink Star Magnolia had bloomed out today. It had not been noticable yesterday! I had seen some white star magnolia in bloom in Lexington yesterday. These are the deciduous types. The green tree in the background, here, is a Southern Magnolia, which is the evergreen type, with the large creamy flowers. I was working in the front yard, and Kathy mentioned that the grass was growing and would soon be needing mowed. The guy across the street must have heard her, because it was only a few minutes later that I heard the sound of a lawn-mower! That is place of business, a funeral home, and so they have to keep it manicured. The light spot in the grass, beyond the mower, is where there was a tree that toppled during the icy weather this winter. They lost another smaller one, too. A beautiful, still, sunny sixty eight degrees this afternoon. Found these two pictures on the internet. I thought they were hilarious, added a caption. (click picture for larger view) I think that's a prairie dog. Right? Feel free to add comments. Only about an inch, but quite a change from last Tuesday's 75 degrees. Won't last long, back to normal 50's after today. This pretty ground cover lends some nice color to the borders. It looks like a watercolor painting, but this picture is not enhanced at all. We had several trees with damage such as this, from the winter ice storm, but still, we fared much better that most of the state. There are still branches to be taken down, or cut up and gotten rid of. Lots to do in a big yard. Kathy's Gazing Ball reflects the scattered clouds on this mostly sunny, breezy, warm day. It was above 70* but I'm not sure how much. There was one large white crocus and several daffodils in Kathy's back yard today. Her cat, Spot, paused for refreshments. I like the white whiskers against the dark of the water tray, and the ripples his lapping made. The stems of these few earliest daffodils were weakened by the cold last week, so the bud was hanging low. I started to take the picture, and out crawled this wasp. He posed for several shots. 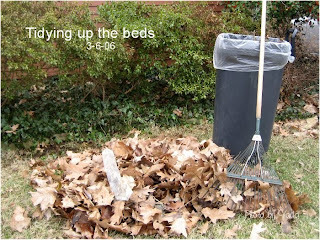 I spent several hours today ( Friday) cleaning the oak leaves out of the shrubery in front of my house. Filled this big bag with leaves, and another with trimmings and the ivy I pulled out of the area beyond this picture to the right. Discovered a bed of crocus coming up there. I want to plant pansies among them and then later, some marigolds of something. I still have some more to do in my yard, and then I will try to help Kathy with hers, which is very large. We still have branches to cut up and carry out, from the ice breakage last month. Wow, a nice surprise today! 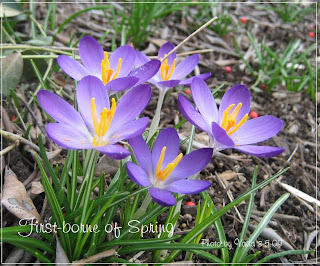 The very first blooms in my yard, this nice little group of crocus. The flowers are a bit more pinkish than this, as I had the camera set on 'vivid blues'. You can click on the photos for a larger image.